We all like knives around this office, and when new models come in for review, we all usually stop what we’re doing to look at the new stock. Generally speaking, however, we hop back to work pretty quickly. While each folding knife design has its own set of unique qualities, they generally don’t vary all that wildly from one another, and we can all refocus on what we ought to be doing without too much of a fuss. However, we occasionally come across a design that’s enough of a departure from the norm that we all have to take turns playing with it for the next hour. This was our reaction when we got a hold of the Gerber Flatiron, a cleaver style folding knife that looks like it would feel right at home in the hands of Sweeney Todd, the Demon Barber of Fleet Street. One of the notable qualities about the Gerber Flatiron revolves around its general beefiness. Closed, has a slim design that feels sturdy and durable. The frame is held together by 3 pins and the folding pivot. Unless you’re reckless with a Torx wrench, the machined aluminum frame probably won’t be falling apart on you. The bad news about the pocket clip is that Gerber doesn’t allow you to adjust its positioning. You’re pretty well stuck carrying this knife in the tip-up position. The good news is that it’s wide and strong. In fact, it might even be a little too strong. The clip will need a break-in period to loosen up enough to avoid the wrestling match between it and your pocket. When you open the knife, you’ll find that the frame lock snaps into place, locking the blade securely into its chopping-est position. Opened, the blade has just a bit of side-to-side wobble, which isn’t too out of the ordinary and doesn’t give us cause for alarm. The Gerber Flatiron employs a cleaver style blade. Rather than elegantly coming to a fine point that would be suitable for piercing applications, the Flatiron blade comes to an abrupt halt at 3.8″. It almost looks like someone at the factory snipped off the front end of the blade, but rest assured, the design here is intentional. Adding to the general stout feeling of the knife, the Gerber Flatiron features a spine that comes in at just a bit thicker than an eighth of an inch. 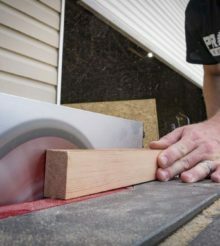 It has a slight reverse curvature, allowing for precision cutting and chopping. For the blade steel, Gerber opted for using 7Cr17MoV. This is a popular blend from China that we see in a lot of budget survival knives. It’s relatively inexpensive to produce, and because of its high Vanadium content, it’s also relatively tough and wear-resistant, while still offering some rust resistance. We did notice, however, that out of the box, this blade comes pre-dulled unlike most Gerber knives. Before you hit the trails, you’ll want to give the Flatiron a once-over with the ol’ whetstone. Thankfully, because the blade only has the slightest uptick, and doesn’t involve any strange angles or serration, sharpening is a pretty simple affair. I do have a few concerns about the hollow grind on this blade. It looks a little uneven, and while this type of grind excels at skinning applications, it is also known for dulling pretty quickly. If I’m skinning, I’m not reaching for this blade design anyway, as it lacks an adequate piercing tip. Realistically, a cleaver does its best work in the kitchen and that’s not far from the truth for Gerber. You can chop and cut to heart’s content, including for meals on the trail. It’s also a nice blade for whittling wood. From an ergonomic perspective, the Gerber Flatiron presents a mixed bag. In the closed position, it’s comfortable to wear and it stays out of the way. However, when I need to open the Flatiron, it’s not going to be like using an assisted opening folder. There are two obstacles here that work together to make opening the knife, and to a lesser degree closing the knife, a bit of a chore. For one thing, I don’t love the thumbhole design. It feels awkward and uncomfortable to use with one hand, and I’d prefer a finger flipper or thumb studs here. It also feels like the blade joint needs a drop of oil to loosen it up. It’s pretty tight and doesn’t flick out easily at first. Once opened, the Gerber Flatiron feels great. One side of the handle features machined aluminum, while the back side features the same silky-smooth, polished steel as the blade. The top side of the handle recesses inward a bit as well, which accommodates the natural curve of your hand. My favorite feature of the Flatiron is the finger choil. It’s large and in charge, and it’s awesome when you need to choke up on the knife for better control. It’s also deep enough that it ought to keep your finger from sliding onto the blade edge. That and it just feels good to hold. The Gerber Flatiron retails for $37. This falls right in line with what you’d probably expect to pay for a folder with this type of steel and no bearing or spring assist. However, the Gerber build quality does feel more solid than most near the same price. I’ve had enough $40 pocket knives loosen up or fall apart on me after a couple years that I’ve started to move toward the higher dollar knives. Finding a knife that feels like it could outlast a shotgun blast seems like a good deal at this price point. From a knife snob standpoint, I should have mixed feelings about the Gerber Flatiron. The truth is that I think that there are a few things that Gerber could improve. However, I find all of those things easy to overlook because I just like this knife. Gerber has built it well, it feels good to hold onto, and because of its unique design, it can cover some bases that my drop point knives won’t tackle quite as well. Of course, that particular road goes both ways, and I don’t think the Flatiron will be my EDC. For those times when I’m hiking the trail or hanging out on the campsite, I’m pretty sure I’ll have the most functional and coolest looking knife around. For more information about the Gerber Flatiron folding knife, visit the Gerber website here.